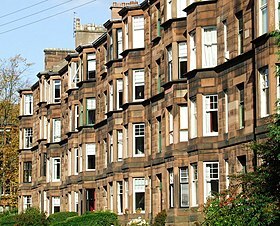 Glasgow, the largest city in Scotland (United Kingdom), is known for its tenements. These were the most popular form of housing in 19th- and 20th-century Glasgow and remain the most common form of dwelling in Glasgow today. Tenements are commonly bought by a wide range of social types and are favoured for their large rooms, high ceilings and original period features. The Hyndland area of Glasgow is the only tenement conservation area in the UK and includes some tenement houses with as many as six bedrooms. Like many cities in the UK, Glasgow witnessed the construction of high-rise housing in tower blocks in the 1960s. These were built to replace the decaying tenement buildings originally constructed in the 1800s for workers who migrated from the surrounding countryside, the Scottish Highlands, the rest of the United Kingdom, particularly Ireland, and further afield (Italy, Lithuania, Poland) to smaller degrees, in order to feed the local demand for labour during the Industrial Revolution which saw the city's population and importance increase rapidly to the extent that it became the 'second city of the Empire'. The massive demand outstripped new building and many, originally fine, tenements often became overcrowded and unsanitary. Parts of inner city areas like Anderston, Cowcaddens, the Garngad, Townhead and particularly the Gorbals, as well as parts of the industrialised East End (Bridgeton, the Calton, the Gallowgate) deteriorated into slums in which disease thrived. Efforts to improve this housing situation, most successfully with the City Improvement Trust, cleared the slums of the old town. 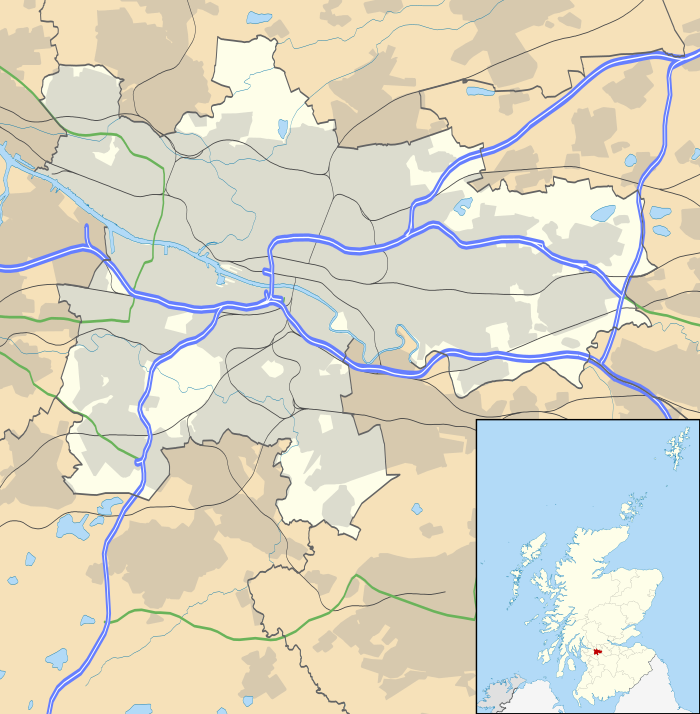 Between the two World Wars, the area of Glasgow doubled in size. Subsequent urban renewal initiatives following World War II, such as those motivated by the Bruce Report, and the Abercrombie Plan, entailed the demolition of slum tenement areas, the development of new towns, the building of overspill estates on the periphery of the city, and the construction of tower blocks. Several districts of the city were designated 'Comprehensive Development Areas' with the intention to raze them and rebuild from scratch with entire communities dispersed. Although the new town option was accepted, with places such as East Kilbride and Cumbernauld being established, the need for thousands of new homes was becoming ever more pressing - almost half of the dwellings in the city had been judged as overcrowded in the 1951 census while in 1957, 97% of housing in the Gorbals was still described as 'unsatisfactory sanitorialy' - and with the Glasgow Corporation keen for as many citizens to remain as taxpayers within their boundaries as possible despite limited space and funds available, the overspill and tower proposals were eagerly pursued. The four main peripheral developments (Castlemilk, Drumchapel, Easterhouse and Pollok) grew to become among the largest in Europe, while other smaller but substantial neighbourhoods (Arden, Barmulloch, Cranhill, Milton, Toryglen) were also constructed, largely consisting of tenement-style housing of three or four storeys, in contrast with the trend of lower-density housing which had been preferred prior to the war following the garden suburb model including a large proportion of cottage flats or 'four-in-a-block' housing with separate front doors (as at Balornock, Cardonald, Carntyne, Croftfoot, Kelvindale, King's Park, Knightswood, Mosspark, Riddrie). The city's initial multi-storey residential experiments in the 1950s at Crathie Court, Moss Heights and Prospecthill were largely successful (and have survived into the 21st century) but their scale of only 10 floors did not address the availability issue sufficiently, and in the next decade the number of towers commissioned by Glasgow and the height of the structures, including ambitious projects in Hutchesontown, Kennishead, Pollokshaws, Red Road, Sighthill and Wyndford, was also one of the highest across the continent. While the facilities in dwellings of both categories were an improvement on the slum housing, the large 'schemes' lacked basic amenities and employment opportunities, were poorly designed and cheaply built leading to issues such as damp which caused health problems; this was also the case with the majority of the tower blocks (or 'high flats' as they were often referred to within the city), many of which were surrounded by low-rise housing on a common design theme from idealised plans which seldom matched reality. Many residents struggled with the lack of provision made for child welfare and social needs such as hairdressing and clothing shops, there were also issues arising from the lack of help given to older members of the community in adjusting to the new buildings and amenities. Some first generation 'emigrees' chose to return to their old neighbourhoods to socialise whenever possible, creating a strange situation where otherwise desolate environments such as post-demolition Gorbals retained thriving public houses on isolated corners, with their clientele having stayed loyal despite moving several miles away to estates with no such establishments. The condition of the schemes and the towers was not helped by the decline of the city's traditional infustries in the same period, with breadwinners finding themselves out of work and their families isolated on the edge of town or fifteen floors up (sometimes both) in a city with low levels of car ownership, contributing to an increase in antisocial behavior like gang fighting and vandalism, and the abuse of alcohol and drugs, all of which earned many parts of Glasgow a generalised reputation as hotbeds of violence and deprivation which should be avoided, in effect new slums in place of those they had been intended to replace just a few decades earlier. As demonstrated elsewhere in the UK, the tower blocks gradually deteriorated, attracting crime and fostering a reputation for being undesirable low cost housing. The cost of maintenance was far higher than anticipated, and by the 1990s demolition was becoming the preferred solution over repair and renovation. While some of the initial tenants were happy living in the towers and chose to stay, the low desirability of the accommodation meant that those who were dissatisfied and moved out were typically replaced by 'problem' tenants with little other option whose lifestyles led to the issues worsening, more original tenants left and the downward cycle continued until some of the blocks were almost empty. The now demolished Red Road estate came to symbolise the mistakes of the city's 1960s housing policy. The policy of tenement demolition is now considered to have been short-sighted, wasteful and largely unsuccessful. Many of Glasgow's worst tenements in areas such as Govan and Springburn were refurbished into desirable accommodation in the 1970s and 1980s and the policy of demolition is considered to have destroyed many fine examples of a "universally admired architectural style", although this traditional style survives in many districts (with variations in design and quality) including Battlefield, Cessnock, Dennistoun, East Pollokshields, Finnieston Govanhill, Hyndland, Partick, Possilpark, Shawlands, Shettleston and Woodlands. The Glasgow Housing Association took ownership of the housing stock from the city council on 7 March 2003, and began a £96 million programme to clear and demolish many of the high-rise flats and refurbish others; such programmes had already been implemented in most of the peripheral schemes, with some refurbishment and some replacement of tenements with individual houses, and this work also continued under the GHA and local housing co-operatives. Wikimedia Commons has media related to Highrise buildings in Glasgow. The map and list concentrates on towers of at least 12 storeys in height built between the late 1950s and early 1970s within Glasgow. Also includes early 10-storey developments at Moss Heights and Toryglen due to their importance in the uptake of the method, but does not include numerous similar developments outside the city boundaries[a] nor modern residential developments (e.g Argyle Building, Glasgow Harbour, Lancefield Quay), nor contemporary buildings with other uses (e.g Glasgow College of Building and Printing, Elmbank Gardens, Livingstone Tower and The Pinnacle - the latter was originally a commercial property before being converted to residential use in the early 21st century). = Partially existing development (some blocks demolished, figures are for original completed total). ABC(4) = Code for development name (number of towers). Map showing Glasgow's residential tower blocks (12 storeys or over) built between the 1950s and 1970s. ^ Nearby developments include Airbles, Calderwood, Cambuslang, Clydebank, Coatbridge, Cumbernauld, Drumry, East Kilbride, Motherwell, Muirhouse, Paisley, Whitlawburn. ^ The first 'multi-storey' blocks (albeit only 10 floors) in the city. ^ Inspiration for the Jeely Piece song about childhood living in the Glasgow towers. ^ Setting for High Times (TV series). ^ See also: The Dalmarnock fire tests. ^ Tallest buildings in the city from 1968 to 2015. ^ Setting for Still Game TV series. ^ Setting for Red Road (film). ^ Setting for Sony Bravia 'paint' television advert. ^ a b Jack McLean (2000-08-13). "Tenement living is the life and always has been". Sunday Herald. ^ "Hyndland Local History". Retrieved 2008-03-30. ^ "for high rise living". Archived from the original on 14 May 2012. Retrieved 3 December 2018. ^ a b W. Hamish Fraser. "Second City of The Empire: 1830s to 1914". The Glasgow Story. Retrieved 11 November 2018. ^ a b c d e Irene Maver. "Modern Times: 1950s to The Present Day: Neighbourhoods". The Glasgow Story. Retrieved 11 November 2018. ^ Gavin Stamp. "1914 to 1950s: Buildings and Cityscape". The Glasgow Story. Retrieved 11 November 2018. ^ a b c d e f g "Housing, Everyday Life & Wellbeing over the long term: Hutchesontown". University of Glasgow. Retrieved 11 November 2018. ^ a b c d Ranald MacInnes. "Modern Times: 1950s to The Present Day: High Rise Developments". The Glasgow Story. Retrieved 11 November 2018. ^ Irene Maver. "No Mean City: 1914 to 1950s". The Glasgow Story. Retrieved 11 November 2018. ^ a b c d e f "Housing, Everyday Life & Wellbeing over the long term: Castlemilk". University of Glasgow. Retrieved 11 November 2018. ^ "West Glasgow". The Glasgow Story. Retrieved 11 November 2018. ^ a b "Moss Heights". The Glasgow Story. Retrieved 11 November 2018. ^ a b "Housing, Everyday Life & Wellbeing over the long term: Moss Heights". University of Glasgow. Retrieved 11 November 2018. ^ a b c d "Housing, Everyday Life & Wellbeing over the long term: Wyndford". University of Glasgow. Retrieved 11 November 2018. ^ "Tower Block UK: Anderston Centre". University of Edinburgh. Retrieved 13 January 2019. ^ "Buildings in Glasgow: Anderston Commercial Centre". Emporis. Retrieved 27 February 2019. ^ "Anderston tower block demolition clears way for £50m estate regeneration". Urban Realm. 3 September 2013. Retrieved 23 January 2019. ^ "Tower Block UK: Anderston Cross CDA Phase III". University of Edinburgh. Retrieved 13 January 2019. ^ "Buildings in Glasgow: Anderston Cross". Emporis. Retrieved 27 February 2019. ^ "Tower Block UK: Anniesland Cross". University of Edinburgh. Retrieved 13 January 2019. ^ "Tower Block UK: Blairdardie South". University of Edinburgh. Retrieved 13 January 2019. ^ "Buildings in Glasgow: Keal Crescent". Emporis. Retrieved 27 February 2019. ^ "Tower Block UK: Bridgeton-Dalmarnock CDA". University of Edinburgh. Retrieved 13 January 2019. ^ "Buildings in Glasgow: Ruby Street RDA". Emporis. Retrieved 27 February 2019. ^ "Tower Block UK: Whiteinch-Broomhill". University of Edinburgh. Retrieved 13 January 2019. ^ "Buildings in Glasgow: Whiteinch-Broomhill". Emporis. Retrieved 27 February 2019. ^ "Tower Block UK: Moss Heights". University of Edinburgh. Retrieved 13 January 2019. ^ "Tower Block UK: Queensland Drive". University of Edinburgh. Retrieved 13 January 2019. ^ "Buildings in Glasgow: Queensland Drive". Emporis. Retrieved 27 February 2019. ^ "Three Tarfside tower blocks demolished in Glasgow". Evening Times. 20 September 2015. Retrieved 23 January 2019. ^ "Tower Block UK: Mosspark Drive North". University of Edinburgh. Retrieved 13 January 2019. ^ "Buildings in Glasgow: Mosspark Drive North". Emporis. Retrieved 27 February 2019. ^ a b c "University of Glasgow - Research Projects - Housing, Everyday Life & Wellbeing over the long term - Case study: Castlemilk". University of Glasgow. Retrieved 13 August 2018. ^ "Tower Block UK: Bogany Terrace". University of Edinburgh. Retrieved 13 January 2019. ^ "Tower Block UK: Dougrie Place". University of Edinburgh. Retrieved 13 January 2019. ^ a b "Buildings in Glasgow: Castlemilk". Emporis. Retrieved 27 February 2019. ^ "Tower blocks go out with a bang". BBC News. 28 November 2005. Retrieved 6 February 2019. ^ "Tower Block UK: Ardencraig Road". University of Edinburgh. Retrieved 13 January 2019. ^ "Tower Block UK: Cowcaddens CDA Phase I". University of Edinburgh. Retrieved 13 January 2019. ^ "Tower Block UK: Cowcaddens CDA Phase II". University of Edinburgh. Retrieved 13 January 2019. ^ "Buildings in Glasgow: Cowcaddens". Emporis. Retrieved 27 February 2019. ^ "Tower Block UK: Cranhill Extension". University of Edinburgh. Retrieved 13 January 2019. ^ "Buildings in Glasgow: Cranhill Extension". Emporis. Retrieved 27 February 2019. ^ "Tower blocks reduced to rubble". BBC News. 3 February 2002. Retrieved 17 February 2019. ^ "131 Allan Street, Dalmarnock, Glasgow". Safedem. Retrieved 17 February 2019. ^ "The Legacy". Disappearing Glasgow. Retrieved 17 February 2019. ^ "Tower Block UK: Summerfield Phase I". University of Edinburgh. Retrieved 13 January 2019. ^ "Tower Block UK: Summerfield Phase I Extension". University of Edinburgh. Retrieved 13 January 2019. ^ "Buildings in Glasgow: Summerfield". Emporis. Retrieved 27 February 2019. ^ "Drumchapel demolition expected to finish in January". Clydebank Post. 2 December 2016. Retrieved 17 February 2019. ^ "Tower Block UK: Garscadden Policies". University of Edinburgh. Retrieved 13 January 2019. ^ "Buildings in Glasgow: Garscadden". Emporis. Retrieved 27 February 2019. ^ "Tower Block UK: Langlands Road". University of Edinburgh. Retrieved 13 January 2019. ^ "Tower Block UK: Ladywell Phase 1". University of Edinburgh. Retrieved 13 January 2019. ^ "Buildings in Glasgow: Drygate". Emporis. Retrieved 27 February 2019. ^ "Tower Block UK: Dumbreck Avenue". University of Edinburgh. Retrieved 13 January 2019. ^ "Buildings in Glasgow: Dumbreck Avenue". Emporis. Retrieved 27 February 2019. ^ Gale, Lindsay (25 February 2015). "First 'Gallowgate Twin' shrinks". Demolition and Recycling International. KHL. Archived from the original on 12 March 2015. Retrieved 17 February 2019. ^ "Gallowgate Twins flats brought down using new UK demolition method". Evening Times. 16 December 2015. Retrieved 17 February 2019. ^ "Lights Out". Disappearing Glasgow. Retrieved 17 February 2019. ^ "Tower Block UK: Gallowgate CDA". University of Edinburgh. Retrieved 13 January 2019. ^ "Buildings in Glasgow: Gallowgate". Emporis. Retrieved 27 February 2019. ^ "9 Coll Place demolition". Canmore. Retrieved 17 February 2019. ^ "15 Forge Place, Germiston, Glasgow". Safedem. Retrieved 17 February 2019. ^ "Coll Place Demolition". Safedem. 13 May 2011. Retrieved 17 February 2019. ^ "Tower Block UK: Coll Street". University of Edinburgh. Retrieved 13 January 2019. ^ "Buildings in Glasgow: Coll Street". Emporis. Retrieved 27 February 2019. ^ "Tower Block UK: Hutchesontown-Gorbals CDA Area B". University of Edinburgh. Retrieved 13 January 2019. ^ a b c d "Buildings in Glasgow: Hutchesontown-Gorbals". Emporis. Retrieved 27 February 2019. ^ "Woman dies in demolition blast". The Herald. 13 September 1993. Retrieved 17 February 2019. ^ "Tower Block UK: Hutchesontown-Gorbals CDA Area C". University of Edinburgh. Retrieved 13 January 2019. ^ "Two tower blocks are demolished". BBC News. 26 February 2006. Retrieved 17 February 2019. ^ "Tower Block UK: Hutchesontown-Gorbals CDA Area D". University of Edinburgh. Retrieved 13 January 2019. ^ "Double demolition for Glasgow Gorbals tower blocks". BBC News. 21 July 2013. Retrieved 17 February 2019. ^ "Tower Block UK: Hutchesontown-Gorbals CDA Area E". University of Edinburgh. Retrieved 13 January 2019. ^ "Video demolition: Gorbals flats razed to ground". Evening Times. 1 June 2008. Retrieved 17 February 2019. ^ "Gorbals flats reduced to rubble in seconds". BBC News. 3 October 2010. Retrieved 17 February 2019. ^ "Housing and Wellbeing in Glasgow: Norfolk Court demolition – the end of an era for Laurieston-Gorbals". University of Glasgow. 13 May 2016. Retrieved 17 February 2019. ^ "Tower Block UK: Laurieston-Gorbals CDA Phase 1A". University of Edinburgh. Retrieved 13 January 2019. ^ "Tower Block UK: Laurieston-Gorbals CDA Phase 2B". University of Edinburgh. Retrieved 13 January 2019. ^ "Buildings in Glasgow: Laurieston". Emporis. Retrieved 27 February 2019. ^ "GHA begin demolition of three Govan tower blocks". Urban Realm. 30 July 2013. Retrieved 17 February 2019. ^ "Tower Block UK: Govan CDA". University of Edinburgh. Retrieved 13 January 2019. ^ "Buildings in Glasgow: Iona Court". Emporis. Retrieved 27 February 2019. ^ "Tower Block UK: Paisley Road West, Halfway". University of Edinburgh. Retrieved 13 January 2019. ^ "Broomloan, Glasgow - High reach demolition". The Coleman Group. Retrieved 17 February 2019. ^ "Tower Block UK: Broomloan Road Albion Site". University of Edinburgh. Retrieved 13 January 2019. ^ "Buildings in Glasgow: Broomloan Road". Emporis. Retrieved 27 February 2019. ^ "Tower block saved from demolition in £7m revamp". Evening Times. 16 September 2011. Retrieved 17 February 2019. ^ "Tall Story: Ibrox". Urban Realm. 30 January 2013. Retrieved 17 February 2019. ^ "Tower Block UK: Ibroxholm". University of Edinburgh. Retrieved 23 January 2019. ^ "Buildings in Glasgow: Ibroxholm". Emporis. Retrieved 27 February 2019. ^ "Five high-rise caretakers sacked after being accused of 'allowing drug deals' in the tower blocks". Daily Record. 6 August 2015. Retrieved 23 January 2018. ^ "Tower Block UK: Kennishead". University of Edinburgh. Retrieved 23 January 2019. ^ "Buildings in Glasgow: Kennishead". Emporis. Retrieved 27 February 2019. ^ "Tower Block UK: Kirkton Avenue". University of Edinburgh. Retrieved 23 January 2019. ^ "Buildings in Glasgow: Kirkton Avenue". Emporis. Retrieved 27 February 2019. ^ "Demolition of twin Knightswood tower blocks gets underway". Urban Realm. 17 September 2014. Retrieved 17 February 2019. ^ "Tower Block UK: Lincoln Avenue". University of Edinburgh. Retrieved 23 January 2019. ^ "Buildings in Glasgow: Lincoln Avenue". Emporis. Retrieved 27 February 2019. ^ "Tower Block UK: Maryhill CDA". University of Edinburgh. Retrieved 23 January 2019. ^ "Tower Block UK: Maryhill CDA Area B Phase I". University of Edinburgh. Retrieved 23 January 2019. ^ "Buildings in Glasgow: Maryhill". Emporis. Retrieved 27 February 2019. ^ "Tower Block UK: Wyndford 1st Development". University of Edinburgh. Retrieved 23 January 2019. ^ a b "Buildings in Glasgow: Wyndford". Emporis. Retrieved 27 February 2019. ^ "Tower Block UK: Wyndford 4th Development". University of Edinburgh. Retrieved 23 January 2019. ^ a b "Tower Block UK: Milton North". University of Edinburgh. Retrieved 23 January 2019. ^ a b "Buildings in Glasgow: Milton North". Emporis. Retrieved 27 February 2019. ^ "Tower Block UK: Battlefield". University of Edinburgh. Retrieved 23 January 2019. ^ "Buildings in Glasgow: Battlefield". Emporis. Retrieved 27 February 2019. ^ "Tower Block UK: Cleeves Road". University of Edinburgh. Retrieved 23 January 2019. ^ "Tower Block UK: Parkhead CDA Phase I". University of Edinburgh. Retrieved 23 January 2019. ^ "Buildings in Glasgow: Helenvale Street". Emporis. Retrieved 27 February 2019. ^ "Tower Block UK: Pollokshaws CDA Unit 2 Blocks 28-30". University of Edinburgh. Retrieved 23 January 2019. ^ "Tower blocks demolished in blast". BBC News. 20 July 2008. Retrieved 17 February 2019. ^ "GHA demolish Shawbridge pair". Urban Realm. 31 August 2009. Retrieved 17 February 2019. ^ a b "A tall order as tower blocks to be demolished". Evening Times. 11 August 2014. Retrieved 17 February 2019. ^ "Tower Block UK:Pollokshaws CDA Unit 1". University of Edinburgh. Retrieved 23 January 2019. ^ "Tower Block UK: Pollokshaws CDA Unit 2 Phase 1". University of Edinburgh. Retrieved 23 January 2019. ^ "Tower Block UK: Pollokshaws CDA Unit 2 Phase 2". University of Edinburgh. Retrieved 23 January 2019. ^ "Tower Block UK: Pollokshaws CDA Unit 2 Phase 3". University of Edinburgh. Retrieved 23 January 2019. ^ "Tower Block UK: Pollokshaws CDA Unit 2 Phase 4". University of Edinburgh. Retrieved 23 January 2019. ^ a b "Buildings in Glasgow: Pollokshaws". Emporis. Retrieved 27 February 2019. ^ "Tower Block UK: North Kelvin CDA". University of Edinburgh. Retrieved 23 January 2019. ^ "Buildings in Glasgow: North Kelvin". Emporis. Retrieved 27 February 2019. ^ "Glasgow skyline changes as Red Road flats are demolished". BBC News. 10 June 2012. Retrieved 17 February 2019. ^ "21 Birnie Court – Blowdown". Safedem. 28 May 2013. Retrieved 17 February 2019. ^ "Second of Glasgow's iconic Red Road tower blocks demolished". BBC News. 5 May 2013. Retrieved 17 February 2019. ^ "Red Road flats: Glasgow city officials apologise for botched demolition". the Guardian. 12 October 2015. Retrieved 17 February 2019. ^ "Exclusion zone lifted after Red Road flats demolition". BBC News. 11 October 2015. Retrieved 17 February 2019. ^ "Tower Block UK: Red Road". University of Edinburgh. Retrieved 23 January 2019. ^ "Buildings in Glasgow: Red Road". Emporis. Retrieved 27 February 2019. ^ "Tower Block UK: Royston CDA Area A". University of Edinburgh. Retrieved 23 January 2019. ^ "Tower Block UK: Royston CDA Area C". University of Edinburgh. Retrieved 23 January 2019. ^ a b "Buildings in Glasgow: Royston". Emporis. Retrieved 27 February 2019. ^ "Safedem commence demolition of Roystonhill tower block". Urban Realm. 10 July 2013. Retrieved 17 February 2019. ^ "Roystonhill block of flats demolished to make way for new homes". BBC News. 1 December 2013. Retrieved 17 February 2019. ^ "Flats demolished in Glasgow regeneration project". BBC News. 22 May 2016. Retrieved 17 February 2019. ^ "Tower Block UK: Royston CDA Area B". University of Edinburgh. Retrieved 23 January 2019. ^ "Tower Block UK: Royston CDA Area B Phase 2 Millburn Street I". University of Edinburgh. Retrieved 23 January 2019. ^ "Tower Block UK: Royston CDA Area B Phase 2 Millburn Street II". University of Edinburgh. Retrieved 23 January 2019. ^ "Tower Block UK: Sandyhills House". University of Edinburgh. Retrieved 23 January 2019. ^ "Buildings in Glasgow: Sandyhills House". Emporis. Retrieved 27 February 2019. ^ "GHA pull down second Scotstoun tower block in regeneration drive". Urban Realm. 10 February 2014. Retrieved 17 February 2019. ^ "Tower blocks reborn as Scotland learns to accept high rises". The Scotsman. 11 November 2016. Retrieved 17 February 2019. ^ "Tower Block UK: Scotstoun House". University of Edinburgh. Retrieved 23 January 2019. ^ "Buildings in Glasgow: Scotstoun House". Emporis. Retrieved 27 February 2019. ^ "TDS make good progress with demolition of Plean Street, Glasgow". C&D Consultancy. 3 September 2010. Retrieved 17 February 2019. ^ "From Heaven to Hell". Disappearing Glasgow. Retrieved 17 February 2019. ^ "Tower Block UK: Blawarthill". University of Edinburgh. Retrieved 23 January 2019. ^ "Buildings in Glasgow: Blawarthill". Emporis. Retrieved 27 February 2019. ^ "Towers razed in overnight blasts". BBC News. 13 July 2008. Retrieved 17 February 2019. ^ "Not built to last?". Disappearing Glasgow. Retrieved 17 February 2019. ^ "Tower Block UK: Sighthill Phase 1A". University of Edinburgh. Retrieved 23 January 2019. ^ "Tower Block UK: Sighthill Phase 1B". University of Edinburgh. Retrieved 23 January 2019. ^ a b "Buildings in Glasgow: Sighthill". Emporis. Retrieved 27 February 2019. ^ "Sighthill masterplan submitted". Urban Realm. 8 March 2013. Retrieved 17 February 2019. ^ "Bulldozers move in to bring down Sighthill flats". Kirkintilloch Herald. 16 April 2013. Retrieved 17 February 2019. ^ "Before and after: The radical transformation of one of Glasgow's housing schemes". Evening Times. 4 January 2016. Retrieved 17 February 2019. ^ "Tower Block UK: Sighthill Phase 2". University of Edinburgh. Retrieved 23 January 2019. ^ "Tower Block UK: Sighthill Phases 2b/3". University of Edinburgh. Retrieved 23 January 2019. ^ "Tower Block UK: Springburn CDA Area B Phase 1". University of Edinburgh. Retrieved 23 January 2019. ^ "Tower Block UK: Springburn CDA Area B Phase 2". University of Edinburgh. Retrieved 23 January 2019. ^ a b "Buildings in Glasgow: Springburn". Emporis. Retrieved 27 February 2019. ^ "Tower Block UK: Carron Street 1st Development". University of Edinburgh. Retrieved 23 January 2019. ^ "Buildings in Glasgow: Carron Street". Emporis. Retrieved 27 February 2019. ^ "Tower Block UK: Springburn CDA Area A". University of Edinburgh. Retrieved 23 January 2019. ^ a b "TV ad's 'paint flats' demolished". BBC News. 21 January 2007. Retrieved 17 February 2019. ^ "Iconic Toryglen flats to be demolished". Daily Record. 3 October 2016. Retrieved 17 February 2019. ^ "Tower Block UK: Toryglen North". University of Edinburgh. Retrieved 23 January 2019. ^ "Buildings in Glasgow: Toryglen North". Emporis. Retrieved 27 February 2019. ^ "Tower Block UK: Toryglen 6th Development". University of Edinburgh. Retrieved 23 January 2019. ^ "Tower Block UK: Toryglen 10th Development". University of Edinburgh. Retrieved 23 January 2019. ^ "Glasgow, Toryglen North Developement, Prospecthill Crescent". Canmore. Retrieved 17 January 2019. ^ "Tower Block UK: Townhead CDA Area B". University of Edinburgh. Retrieved 23 January 2019. ^ "Buildings in Glasgow: Townhead". Emporis. Retrieved 27 February 2019. ^ "Tower Block UK: Northinch Street". University of Edinburgh. Retrieved 23 January 2019. ^ "Tower Block UK: Woodside CDA Phase 1". University of Edinburgh. Retrieved 23 January 2019. ^ "Buildings in Glasgow: Woodside". Emporis. Retrieved 27 February 2019.